Braces can straighten your teeth to give you a more attractive smile for life. The process can take 18 months to two years or more, and this amount of time can seem unending when you first get your braces. Counting down your brace time can help the time pass more quickly and build the excitement for when you finally get your braces removed. Crossing out each day on a calendar is a standard way of counting down time. You can make this more personal by designing your own calendar to help you count down. Use an online customization service to upload photos or designs for each month. Each month’s picture can also display the number of months remaining until you expect your braces to come off. 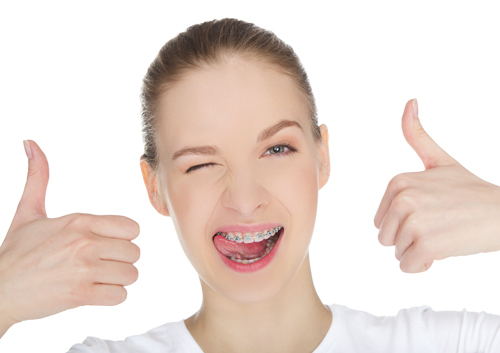 When you receive regular rewards for continuing to wear your braces, they can seem less burdensome. Plan to buy yourself a reward every month that you wear your braces for the duration of the treatment. The time will pass much faster when you feel you are earning rewards for your patience. Use strips of paper to make the links of your chain, and add a new link each week to lengthen the chain. Before sealing each new strip of paper into a circle, write on it a reason why you are getting your teeth straightened, or an event in the future when you will appreciate your straight teeth as you smile. Purchase a large pad of blank white paper. Write a “0” on the bottom sheet and a “1” on the next, and continue until you reach the number of days remaining in your treatment. Rip off the top sheet each day to see how many days are left and remind yourself of the progress you are making. If any of your friends get braces around the same time as you, share the experience. Make a pact to celebrate each trip to Chubb Orthodontics when one of you receives news about your progress.